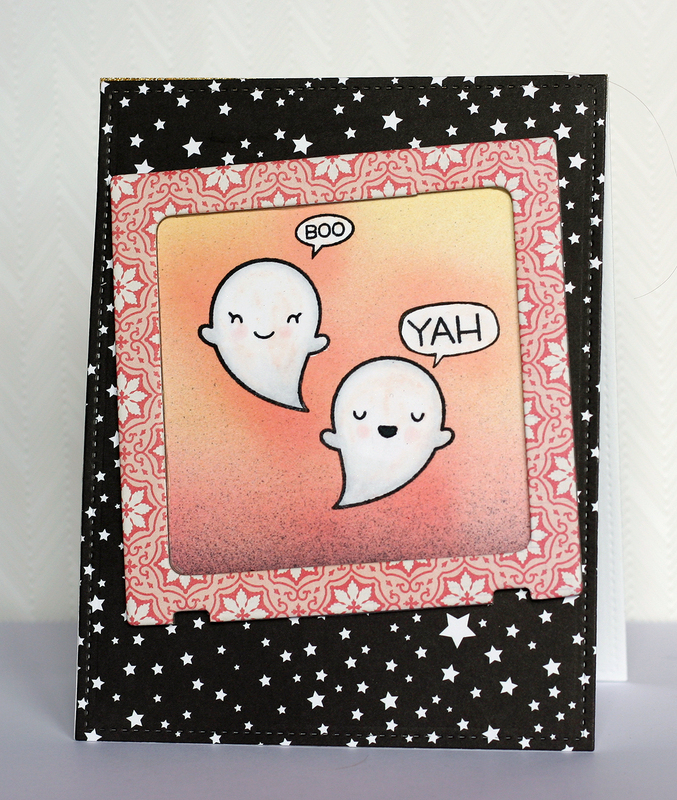 I'm not saying it's so, but I might have gotten these cute ghost stamps by Lawn Fawn just because there was a sentiment saying BOOYAH. If it were true I would be kinda nuts and I'm not really. Well, maybe. Anyways, there is a sentiment in the set saying BOOYAH and I thought it was so fun that when I made the first card with the set I used... half of it. I did notice the little speech bubble saying BOO and then I thought I could use the last half of the sentiment to spell out YAH and make them say it together. I drew my own speech bubble for the other ghost. I did some masking on the ghosts and the bubbles and then airbrushed the background with the eBrush and Spectrum Noir markers. These ghosts are so cute!